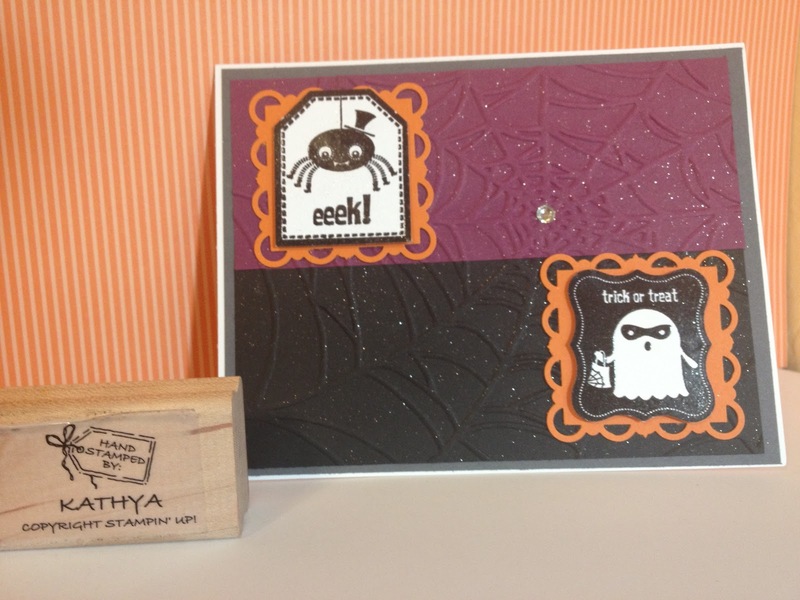 Our new Stampin' Up! catalog was released earlier this year, the new kick off date was June 1st and amazing how quickly time is going by! One of the perks that I enjoy about being a Stampin' Up! demo is that we can pre-order items in advance before they are released to the public. I ordered a few new items and I've slowing starting creating with some of them. This card is for a swap my Upline, Diana Gibbs is organizing using new stamps from the catalog. I love Halloween, though where I live, we don't get too many trick-or-treaters. The stamp set is called "Tricky Treats" and all the images are so cute! You can barely tell, but the spider web is covered with shimmer spritz. Let me know what you think! Thanks for taking a look and wish me luck as I continue this blogging adventure! Hey Chica tee hee thank you so much for the comment on my card and yes now that I found you I will probably be back. Stamp on.